Buying some designer clothes for your wardrobe is a sure-shot way of remaining trendy and fashionable. Try to include some best colour combinations and patterns while choosing trendy dresses for parties. You can find latest designer dress patterns in a plethora of textures, designs and colours. Designer dress patterns are made with creative styling keeping in mind the comfort of the wearer. Some of the latest patterns include high-end varieties of salwar suits, sarees, evening dresses, gowns and formal suits. Designer wedding wear also is becoming order of the day. Evening gowns are also very popular. Rich fabrics are used to make these gowns and some of the richest colours in vogue include red, green, grey and black. Light floral patterns are also popular these days. You can wear these dresses to parties and also to social events. Latest designs in fashion these days are adorned with velvet patches, ribbon work, diamonds, crystals, embroidery and zari work. Most of the designers today are using expensive fabrics to make these dresses, including pure silk, raw silk, shimmer georgette, shimmer net, brocade and crepe. Designer clothes for men include kurta pajamas, suits, pants, T-shirts and sherwanis. 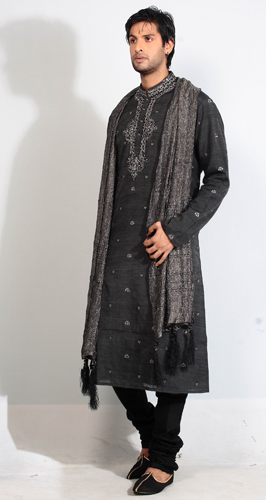 Kurta pajamas, sherwanis and suits are more appropriate for parties, social events and wedding functions. Kurta pajamas are fashionable, yet comfortable at the same time. Designers today are incorporating western designs into existing patterns of these dresses in order to create a unique design in men’s outfits. Dark colours are more prominent in men’s designer dress patterns; however, light colours look sophisticated too. This means that the colour of dress you choose entirely depends on your personal choice. Light embroidery, rich mix of colours and sequin works are also amongst the preferred patterns. Whether you are looking for a western style dress or a traditional outfit, you can find a dress that suits your requirement and preference. But before purchasing a dress, make sure that it is made up of high quality material, so that you do not end up wasting huge amount of money on an ill-faceted dress. If your budget does not allow, you need not go for branded designer dress patterns. You can visit an online or offline store, and select the dress of your choice, as per the occasion and your budget.